You may choose to renovate the exterior of your home or enhance its curb appeal for a variety of reasons, but one of the most common is the desire to add value to the property. Even if you are not planning to sell your home anytime in the near future, making some simple renovations can go a long way towards improving the marketability of your home. When it comes to making changes and improvements to your home’s exterior, some renovations are simply a better overall value than others, garnering a bigger return on investment. One of the top-ranking home improvements is a new front door, with a return on investment over 95%. Adding a new front door is relatively inexpensive, but the improvement to the appearance of the home, as well as the added advantages of improved safety and energy-savings make a new front door one of the best investments you can make. 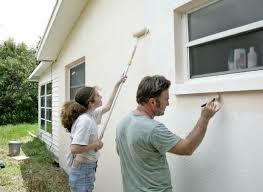 Replacing other exterior elements, such as windows and siding, also yield a high financial return. Defining the areas of your property can add dimension and value to your property. Fencing around the perimeter of the property may be functional or simply decorative, but it goes a long way towards defining the property physically, as well as separating it from the nature strip and street without completely walling it off. Caring for your lawn and garden areas can make a huge difference to a visitor’s estimation of your property. Fertilize and tend the lawn, including conservative mowing, seeding in damaged spots and watering it as needed. The edges of the lawn should be well defined, either by using a trimming tool or adding another substance such as small pebbles, stained wood or wrought iron edging. Flowers, bushes and trees are usually a part of a home’s property and should be well tended. Cultivated areas show prospective homeowners that you care about your property, and that care will likely be reflected inside the home as well. If you do not already have a garage of any kind on the property, the addition of one will definitely add appeal to your home. A single car garage may be all that will fit on your property, but it still adds valuable space to the home in addition to providing shelter for a vehicle. Be sure to define the driveway as well, whether it is paved with cement or blacktop, or simply covered with stones. Keepin mind that garages come with garage doors, and these doors need to be properly maintained to function. A garage door spring replacement may be the most common type of maintenance that will be needed on your garage door, so be familiar with the workings of the door so you know when to change a spring or undertake another repair before it becomes damaged. Renovations, for your own satisfaction or to improve market value, need not be complex or expensive. Ultimately, you want to make the changes that make your home look better, feel more comfortable, make it more functional, and that offer the best return on the initial investment.